Lake Arrowhead is a 36-hole golf facility located in the central part of the Badger state. Defined by sandy soil, plentiful pine forests, and scrubby oaks. The Pines and the Lakes courses give the golfer a feeling that is not found anywhere else in the country. Lake Arrowhead and its two 18-hole courses is located on Highway 13; 35 miles north of Wisconsin Dells, and 13 miles south of Wisconsin Rapids. The two courses are among the elite public courses in the Midwest. Golf Digest has given both the Pines and Lakes courses 4.5 stars in their "Places to Play" rankings. Located 13 miles south of Wisconsin Rapids on Highway 13. Up to 1 year in advance. Whether you're looking for a place to raise your family, an active retirement community, or a relaxing weekend retreat, you can live your dream at Lake Arrowhead. Choose from a variety of homes and sites, including waterfront, golf course and lake-access properties. Lake Arrowhead welcomes members who enjoy their homes for short weekend getaways or year-round living. Our actively-involved members volunteer to help local charities, organize special events and fundraisers, coordinate craft fairs, and have even established the Town of Rome Farmers Market. Each one of our members helps to make Lake Arrowhead a place you'd be proud to call home. Contact Lake Arrowhead at 715-325-2929 for more information and details on holding a golf outing at the course. At Lake Arrowhead, you'll find exceptional indoor and outdoor spaces that will make your event truly spectacular. Whether you exchange vows on our golf course or entertain guests in our beautiful banquet spaces, Lake Arrowhead gives you a variety of indoor and outdoor venues to make your day memorable. Wedding on the Green - Exchange vows on the 4th fairway of The Pines golf course. This incredible location gives you a dramatic bridal walk down the aisle, with a gorgeous fountain as your backdrop. Wedding on the Patio - Our newly expanded patio located at the Pines Clubhouse is an award-winning addition to our venues. The patio extends off our banquet facility so you can have the outdoor wedding of your dreams and move indoors to our spacious banquet facility for your reception. Wedding at South Lake Center - Host your ceremony and/or reception at this beautiful location overlooking the 300-acre Lake Arrowhead. It features a lovely outdoor spot with an open-sided pavilion for all-weather events. Wedding on the Lakes pond - For that perfect picturesque wedding, imagine being walked down the grassy aisle towards the pond with a beautiful fountain between holes 1 and 9 at the Lakes golf course. The extraordinarily gorgeous plantings around the flag pole with the pond as a backdrop will enhance any photo of your perfect wedding day. The Lakes golf course pavilion - Our largest outdoor location, this serene spot is ideal for a summer wedding celebration. Here, you can host an open-air wedding in the pavilion. With beautiful ponds and fairways nearby, this pavilion lets you and your guests enjoy the beautiful backdrop of our natural surroundings. 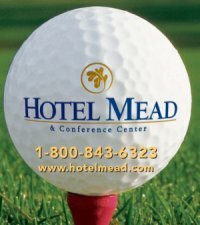 Hotel Mead Conveniently located in the heart of Central Wisconsin, Hotel Mead offers distinctive, luxury accommodations at affordable prices. We invite you to relax in our newly renovated public areas and guest room accommodations featuring contemporary comfort and a host of amenities designed to make your visit unforgettable. Contact Lake Arrowhead at 715-325-2929 for onsite or nearby dining options. This profile was last updated on 03/20/2018 and has been viewed 41,688 times.